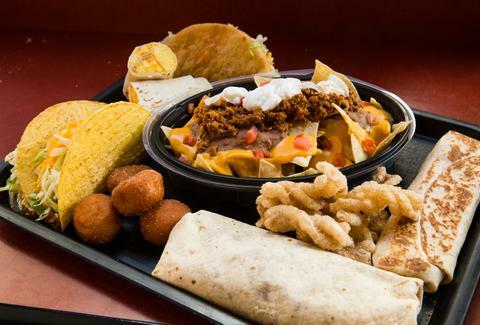 Following its recent foray into the world of "forbidden" black rice and spicy Pop Rocks burritos, Taco Bell is once again experimenting with bizarre -- but good-sounding -- stunt foods. This time, the chian is testing a new creation called Crispy Dipping Burritos, which are essentially deep-fried mini burritos paired with dipping sauces like nacho cheese, spicy ranch, sour cream, and guacamole. Stuffed with seasoned beef and cheese, some have described them as tex-mex egg rolls or tiny chimichangas. At the moment, it appears you can only snag them at select locations around Minneapolis, Minnesota and Hudson, Wisconsin, though if they prove successful there it's entirely likely you'll see them hit menus across the Taco Bell-verse. For now, the burritos are served as a two-pack for $2.99, or as part of a combo meal that also includes two tacos and a drink, for $5. Reactions from people who've tasted them are good so far, and some have likened them to the chain's Rolled Chicken Tacos, which are a fan favorite. We've reached out to Taco Bell for more details -- most importantly, whether you can expect to see these crispy tubes of meat arrive in more of its locations anytime soon. In the meantime, you can always settle for the chain's new fried chicken-stuffed quesadillas.